I will take with me a 70 l backpack identically to this one. The problem that I have is that I'm not sure if I can take it for free as included baggage, I've found contradictory information and I would not want to pay a lot of money at the airport for my baggage. So I took a look on skyscanner for flights. The cheapest ones I've found are done by KLM and Air France. About KLM I took a reseach and I'm pretty sure that they don't allow more than 12 kg of luggage for free so my big bag would not fit in that. If not because of the weight for sure because of the dimensions. 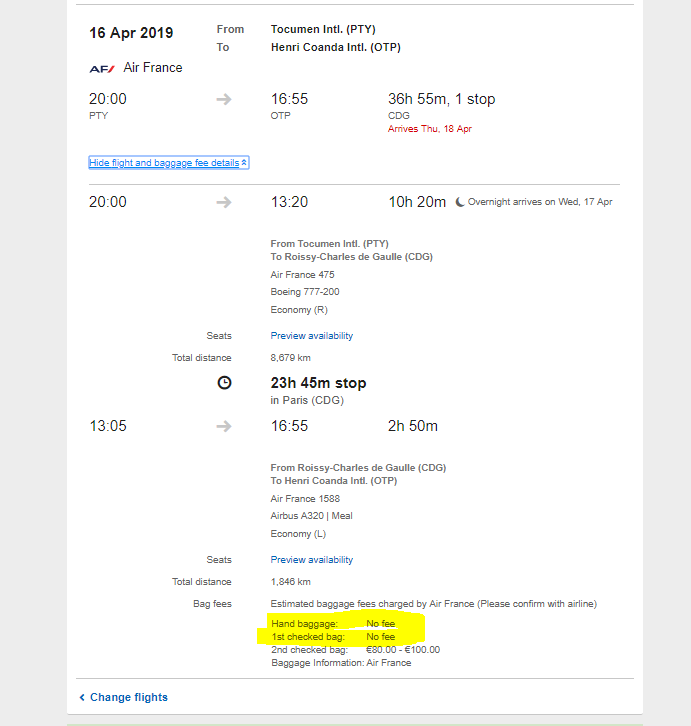 Related to the Air France flight which can be seen on the search result here, the things are not clear to me. I select ebookers from the list under and it opens this page. I don't know if the link can be opened so I will put a screen shot. As you can see, the 1st checked in baggage and hand bag is for free. Great! If I go to their website and search for my first segment for example, Buchares-Nice, it says that only a 12kg hand luggage is free and for a 23kg one I should pay 25/35$. Baggage allowances aren't necessarily the same across an entire airline. They can depend on your specific itinerary and also your booking class (e.g. Economy, Economy Flex, Business, etc). In particular, it's pretty common that economy tickets include a checked bag when the itinerary includes a long-haul intercontinental flight, but not when it is entirely "domestic". 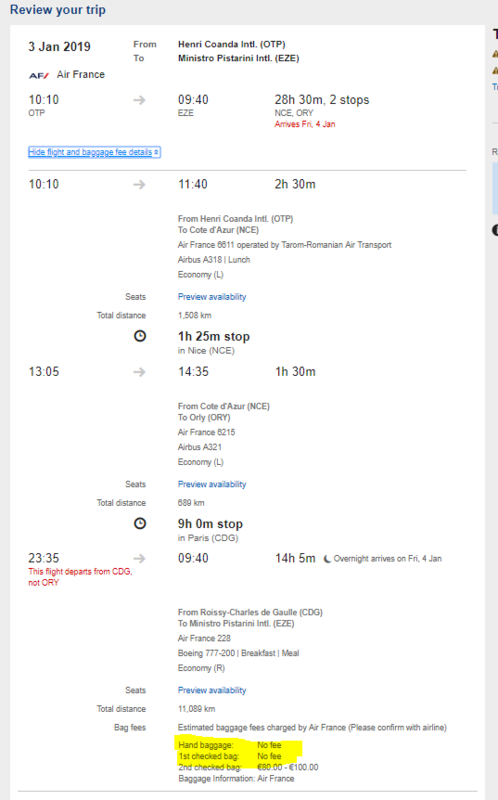 So it is entirely possible that you'd get a checked bag when flying from OTP to EZE via NCE, but not if you only flew from OTP to NCE. And I think you're misinformed about KLM's policy: according to https://www.klm.com/travel/gb_en/prepare_for_travel/baggage/baggage_allowance/index.htm, one checked bag is included on all intercontinental and European flights, except for "Light" fares. Not the answer you're looking for? Browse other questions tagged air-travel luggage flight-search-engines backpacking air-france or ask your own question. Is 4:30 enough time to transfer from Orly to CDG?